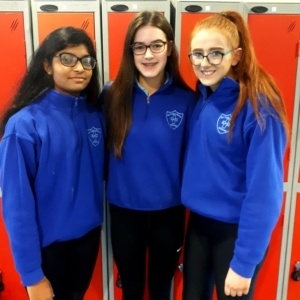 Congratulations to OLB Environmentalists; Ébha Crehan, Veena Dandu and Aoife McDermott, who have been selected as one of the top teams and will go on to the next stage of this year’s Sustainable Energy Authority Ireland’s One Good Idea Project. The SEAI noted the exceptionally high standard of projects, hard work and creativity in this year’s entries. The competition, which is now in its 10th year, gets people thinking about ways in which we can reduce our energy use. The project helps students develop a number of skills including research, marketing and presentation skills as well as group work, campaign management and confidence building. Ébha, Veena and Aoife will now begin the second stage of the project which will see them activate their campaign. They will take their research and creative brainstorming and use it to drive an awareness campaign about their One Good Idea – “Ditch Those Bags, Get Healthy Back”. Their campaign will focus on the idea of wheelie bags; enabling more students to walk to school instead of an over reliance on cars. The girls will be guided through this second stage by a SEAI mentor who will provide practical tips on how to activate and deliver a successful campaign and document their journey. This year the competition has opened itself up to the digital era and the girls will also be required to make a 1-minute video about their project, which will hopefully engage a larger audience and help them to understand the girls’ vision more clearly. Well done girls. Keep up the great work.